Have you ever had a thread that looked one color when the stitches went one direction and another color when they went ion the opposite one? This characteristic is called directional light and is common with many kinds of threads, including perle cotton, floss, many silks, and many silk/wool blends. It is a subtle effect but one that is quite clear. It’s subtle enough that the color changes in most multi-colored threads and overdyes mask it, but in solids and semi-solids, it is usually pretty clear. You can check to see if the thread you want to use has directional light pretty easily. Just stitch a small box with stripes of Alternating Diagonal Gobelin. Do they look as if they alternate shades? Then your thread has directional light. Using this characteristic allows you almost to create shades between the thread shades. And it easily adds more texture to your stitching. The critical thing for directional light is a change in the stitch direction. This effect happens with both diagonal and straight stitches. There are two types of stitches to seek when using this effect. The easiest is to look for stitches that have stitches in two different directions from the beginning. The Interlocking Chevrons Bargello pattern (from my book Bargello Revisited, available here) has this as a project. While you can see the color change here, it is more apparent in real life. Other stitches, such as Serendipity or Woven Plait that have direction changes will also work. The other thing to do is to take a stitch usually done in one direction and reverse portions of it. 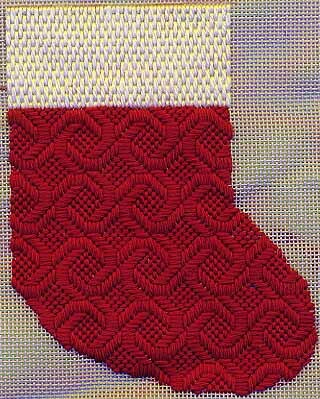 While we often think of this with box stitches, you could also do this with many diagonal stitches. You can reverse the direction with every stitch, making a subtle check. Or you can reverse the direction with every row, as I did with the large areas of the adobe church, a dede vintage canvas stitched with Valdani floss. I love how such a simple trick creates such lovely changes. And it’s something any stitcher can do.